To wash all of this glorious food down, Lucques offered two special lemonades, one with brandy and the other with Jack Daniel’s. Both seemed to be very popular on Sunday. The only thing missing was a “wafer-thin mint” at the end of the meal. A Lucques Standard: the Maker's Ruby. 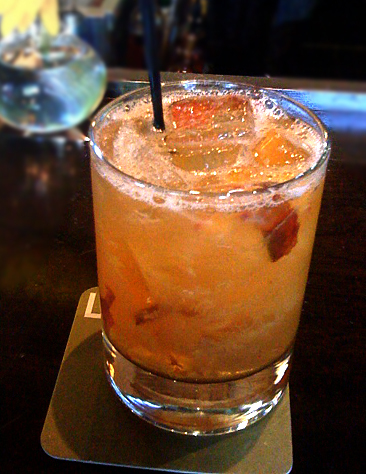 The Maker’s Ruby was excellent, tangy and perfectly refreshing for a late Sunday afternoon. I’m sure it would’ve made an excellent compliment to all of the smoke and spice. Other Standards include the Lucques Gimlet (Hangar One vodka with fresh lime juice and mint) and the Green Hound (Chopin vodka, cucumber and grapefruit juice, garnished with mint). Summer in a glass: the Fragola Balsamico. If you’ve ever wanted to sip summer in a chilled glass, the Fragola is the cocktail for you. The Miller’s botanical notes are dominated by the upfront, fresh strawberry aroma and flavor, anchored by the bitter orange of the Cointreau and enhanced by the balsamic reduction. The Fragola’s brilliant red hue makes for an easy conversation starter. The other Seasonal option was the Black on Black: Leblon cachaça with blackberry compote, thyme, black salt rim. With summer winding down, now is the time to savor the best of the season. 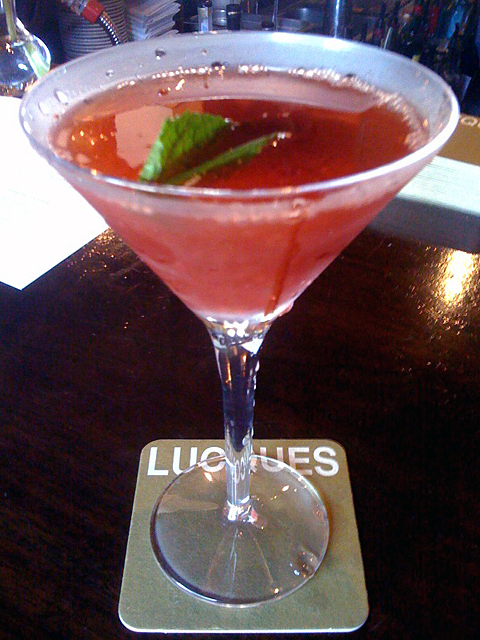 At Lucques, that means more than just what’s on your plate; you’ll taste it in your cocktails as well.